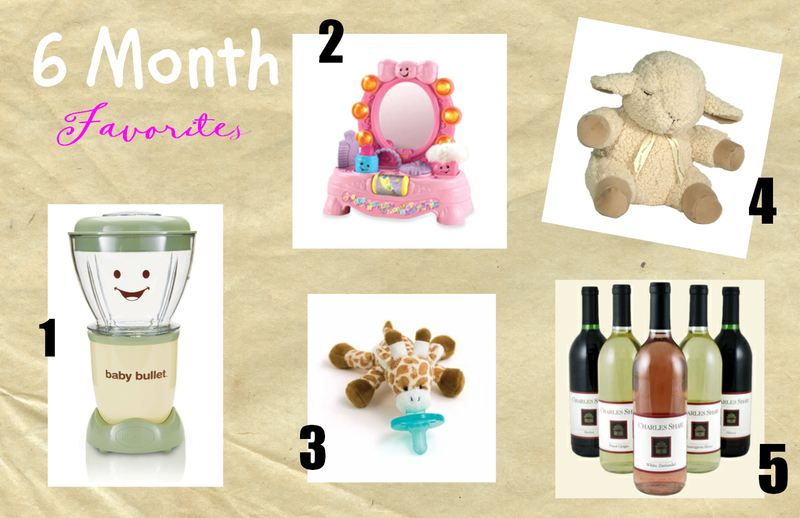 Since I will be a mom to a seven-month old in a week, I figured it was time to share our 6-month favorites. This month has been eventful, with lots of highs & a couple of lows (a lack of sleep & the results of it). So our favorites are pretty much all over the place. 1; Baby Bullet Complete Care System; I must be honest. My super helpful and rock star husband makes most of Waverly’s food with this product. But from what I have witnessed and tried on my own, it is super easy to use. It is a cheaper way to make healthy, organic baby food and we love it. 2; Fisher-Price Laugh & Learn Magical Mirror; I don’t know who loves this mirror more … me or Waverly Maye? 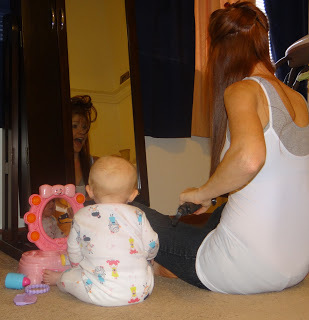 It is so cute, and keeps Waverly entertained while I get ready right next to her. It is so fun for both of us and pretty much fulfills one of my lifelong dreams. 3; WubbaNub Giraffe; The WubNub is a hot commodity in our home. It is that comfort item for Waverly, without a doubt. We get really nervous when we misplace it. 4; Cloub B Sound Sheep; Our other nightly must-have. We would be lost without our sleep sheep, so much so that it makes me nervous for our future (Will Waverly be ten with her sleep sheep? Is that a problem?). The white noise it provides definitely helps our sweet girl sleep, and that certainly comes at a premium these days. 5; Trader Joe’s Wine; OK, so this one is obviously for me. As previously posted, we have definitely had some sleep issues this month. Ones that resulted in more than a few tears to get Waverly Maye to sleep on her crib on her own. So with no further explanation, a glass of wine is certainly a favorite of the moment. Actually, an essential. And Trader Joe’s cheap wine? You can’t beat that. When I saw Two Buck Chuck on your list of essentials, I knew we had to be friends 🙂 I am currently pregnant with my 3 and so not one of those lucky people who proclaim "I don't miss alcohol at all! '- wine definitely helps with parenting at the end of the day! I look forward to following along! Thank you! Oh gosh that is probably my future, too! We are going to have to order back-ups too! We seriously get nervous when we can't find it! Haha! Looking forward to following your blog! Answer to your question from my blog: Cullen and Bennett are 25 months apart and B and baby will be 26. I love the 2 year age difference. My boys play together and have so much fun. It is nice that my older son isn't into toys, games or shows that are too old for my younger one to enjoy too. It is also good for being a stay at home mom because they are on the same afternoon nap schedule (hence my ability to write emails back!) and are entertained by the same places. I have heard other arguments for having them further apart, but we really love the ages they are! Hhaha I love your list especially the wine!!! To me, wine is a parenting ESSENTIAL. A laugh and learn magical mirror? Shut up. How have I not seen this before, given my shopping obsession?! Seriously, I'm headed to Amazon right now to get one. The pic of you both sitting next to each other in front of your mirrors is SO CUTE!! !